The Future's Rosie: Stand up routine! This weekend we were honoured to have been invited to Rosie's friend Ella's 2nd birthday party. 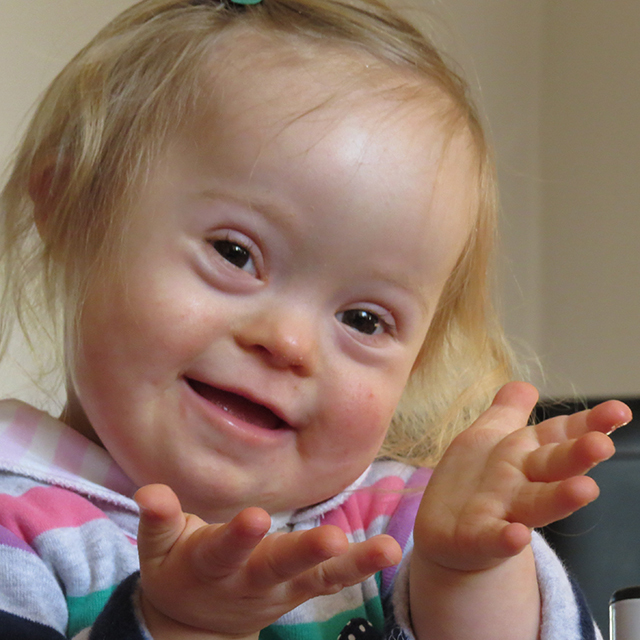 We had a fantastic time meeting Ellas family and seeing other parents and children from our local DS support group. 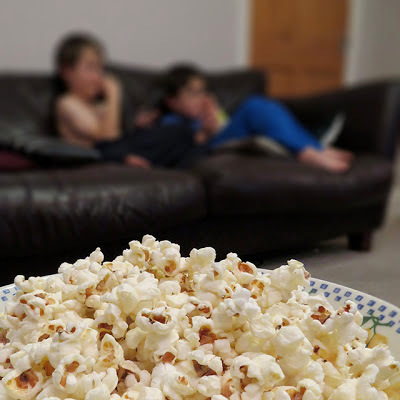 I'm often unable to attend the monthly group meetings due to Saturday morning football commitments with my Sons so I really appreciated the opportunity to sit down and catch up within the intimate surroundings of Amy and Ian's lovely new house. 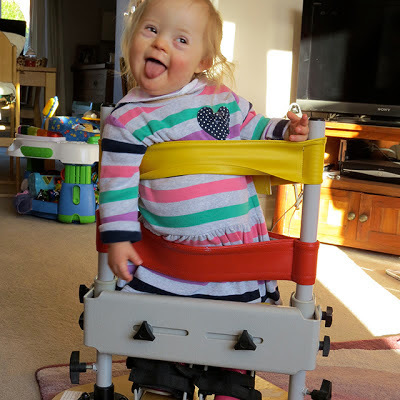 Read more about Ella and her big day over on her Mummy's blog 'A Different View'. Since Rosie's birth we have been lucky enough to meet some amazing parents of children with DS and we owe a great deal of thanks to our local support group for this. 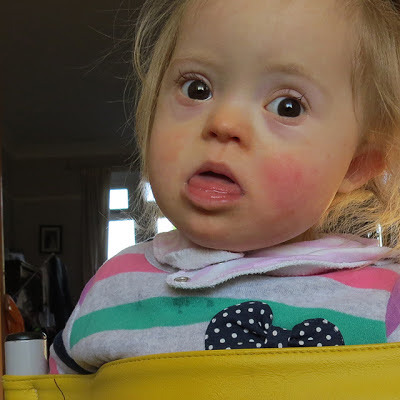 In the early days Karen gained alot from the monthly group meetings – chatting and exchanging experiences with other parents and she soon had regular contact with many of the Mums during the week, meeting for coffee etc. In truth I never felt so at ease the first couple of times – I must point out this is in no way reflective of the group or its people, far from it in fact, this was my issue. 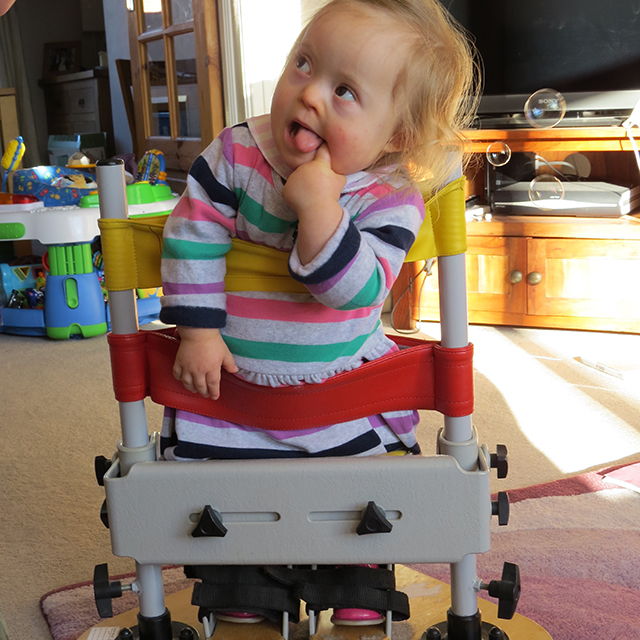 I found it really overwhelming walking into a room full of children with DS and their parents, I guess it stemmed from the realisation that hit me when I first walked into the room that Rosie was a part of something 'different'. Little did I know at the time that the 'different' I feared slightly was soon to become the most positive life enriching experience I could have ever imagined. I now really look forward to the meetings (when I'm able to attend) and am really excited for the forth coming Christmas party! Rosie's latest developmental aid from the physio is a rather barbaric looking standing brace. It resembles some kind of Victorian straight jacket for the legs! Needless to say she isn't overly impressed by it, although to be fair being strapped into something like this wouldn't be my idea of fun either. However, she is being so lazy at the moment, showing no signs of wanting to crawl or support herself that we're adamant to persevere with it! 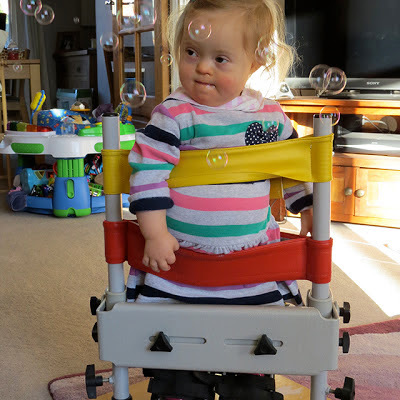 We tried a new tactic at the weekend where Rosie's brothers stood on the sofa and blew bubbles down over her – She loves watching the boys, so coupled with the bubbles it was the perfect distraction from the fact she was strapped to this brutal contraption. 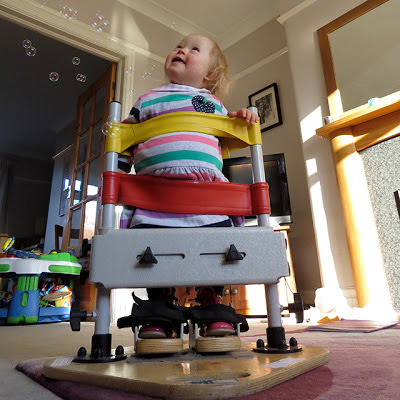 The bubbles also encouraged her to reach up too – making her legs work to support her upper body without her really realising. The boys efforts (and ours) were rewarded with a late night snuggled up in front of a film eating copious amounts of homemade pop corn! Gosh, that does look like a strange contraption, but your daughter looks happy and beautiful so hope it isn't too much of an incumberance.